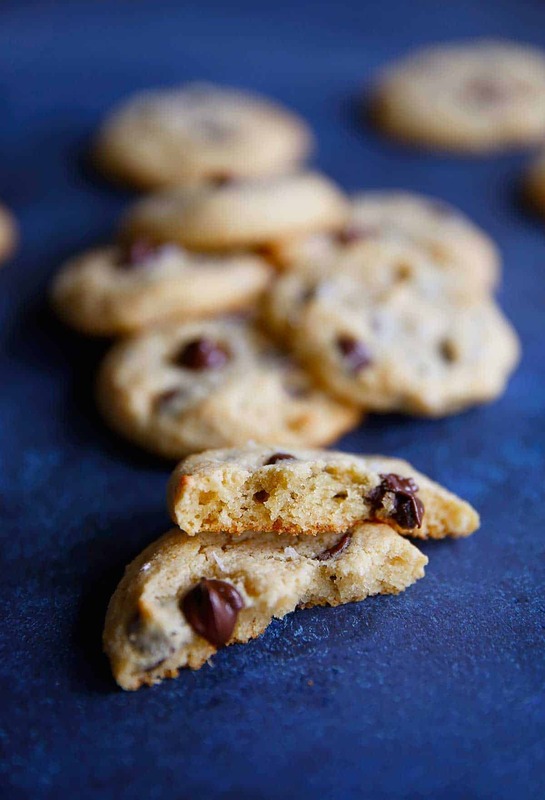 Looking for the perfect Paleo Chocolate Chip Cookies? These are soft, chewy, chocolate-y, and simply delicious. They are easy to make and are sure to be a hit in your home! You won’t be able to tell that they are gluten-free, grain-free, and paleo-friendly! Ahhh feels like home… a warm chocolate chip cookie dipped in milk (or in my house, almond milk). I love the smell of cookies in the oven, I mean who doesn’t, right? These Paleo Chocolate Chip Cookies are a treat, and one you don’t have to feel quite as guilty about. This is one of my favorite recipes with great reviews! I like to sprinkle the cookies with a coarse flaky sea salt before baking, because sea salt and chocolate are the ultimate combo in cookies! Position oven rack to the middle of your oven and preheat oven to 350°F. The middle rack will ensure even baking. In a medium-sized mixing bowl combine almond flour, coconut flour, baking soda, and salt. In a small mixing bowl combine egg, honey, butter, and vanilla. Drop tablespoons of dough on a parchment lined baking sheet. 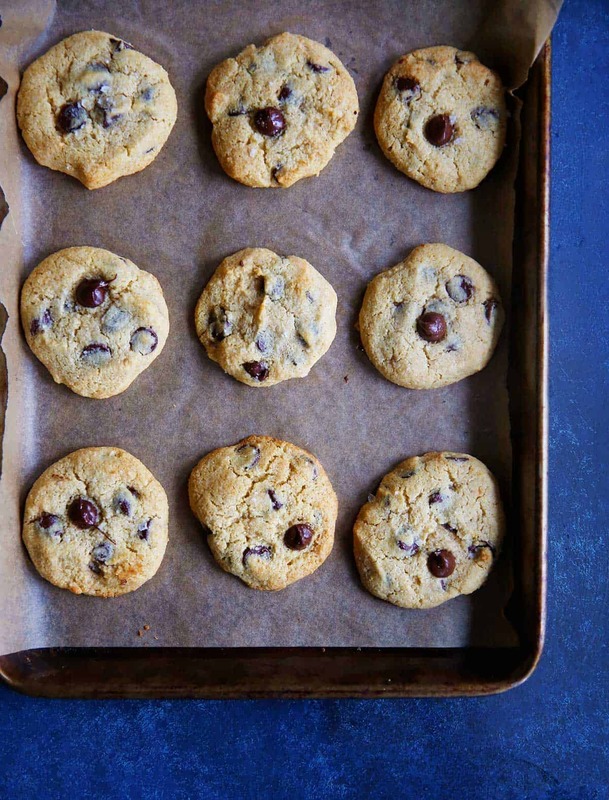 Bake for 10 minutes (for soft, slightly undercooked cookies- my favorite!) or 12 minutes (for fully cooked cookies). Let cool and serve (perhaps with a glass of almond milk)! Using grass-fed butter is my preferred method for delicious copy-cat Tollhouse style cookies, but you can use coconut oil if you are dairy-free. Images updated in March, 2017. These were amazing. I used rice malt syrup instead of honey and also 85% dark chocolate. I also blanched by own almond and made almond meal. Perfect, guilt free treat. SO glad that you loved them!! Just made these and they were delicious, but mine are very flat compared to the photo here. Oh well, they still tasted great!! Mine were YUMMY but turned out flatter then a pancake. Tips? Weird Mollie! Did you add the baking soda? Second time making these on this cold, snowy evening in Toronto and they are perfect! Thanks for the great recipes Lexi! New to Paleo, tried these and even my teenager liked them. Nice treat fresh out of the oven in very windy Walla Walla, Wasington!! These are AMAZING! I was able to get 15 cookies from 1 batch. I didn’t have honey so I substituted with baking stevia. I also refrigerated the dough for 15 minutes before baking so they could hold their shape better. I don’t think I’ll be making traditional cookies any time soon. Thanks!!! Did anyone else’s come out quite dry tasting? I had problems with the mix blending together well, but I thought the stickiness was due to my coconut oil not being completely melted when I added it. Also, during the instructions, it never mentions adding in the chocolate chips so I almost forgot to and ended up pushing them in one by one into the dough already on the tray. Hi Shelley, I’ve never had that, actually quite the opposite, I always find them very moist. Make sure to melt your coconut oil or it hardens when mixed with other ingredients. I will adjust and put in the chocolate chips- thank you! Can I sub coconut flour for anything else ? Hi Kelly! We used softened butter! Enjoy if you make them!! Today I am home for a snow day and about to make these cookies! I’ve been wanting to make them for a while and now I finally have found a free moment 🙂 Thinking of pairing my cookies with some almond milk ice cream for a chip-wich indulgence after dinner! Thanks, Lexi! These are THE BEST paleo cookie I’ve ever made! Not an understatement! Everyone gobbled the first batch up so fast that the second time I doubled the recipe. When I doubled, I used half coconut oil, half ghee, and cut the honey down to about 4 tablespoons total. I just finished up the 21dsd so that seemed sweet enough for me! Many thanks for this amazing recipe! These cookies are AMAZING! Even my non-paleo husband agrees. I subbed one tablespoon of maple syrup for the honey and the chocolate/maple syrup combo is to die for. Thank you! Hey! have to make these for a dinner party tonight and i’m out of coconut flour and well, its not available in the market atm … can i use desiccated/shredded coconut? or substitute for anything? if yes, does the amount of liquid reduce? please please reply soon! Help me with a substitute? Please? You can try subbing additional almond flour. I just tried making these cookies and they turned into one big cookie on the pan lol kinda like a bar. I just cut it into pieces. The taste was ok but the texture was very oily. I used coconut oil. Not sure what happened. I know a recipe is good when my youngest eats it and then asks for another batch the following evening. These are by far the best grain-free sugar-free chocolate chip cookies I have ever made and I have tried a lot of recipes. I made you chocolate chip cookie (toll house copy cat) so good!! Do you have the nutritional breakdown assuming 1 dozen cookies? Tastes just like the bacon chocolate chip cookie at HG supply co in dallas….minus the bacon, which can always be added to replicate. That sounds amazing. Bacon in these next for sure! So so happy you liked them! Is there a substitute for the almond flour? You can try ground sunflower seeds! How long do these cookies stay good for and should I refrigerate them? I’m going on vacation for 4 days and will make them before I leave and wasn’t sure if I should bake them right away or if I can refridgerate the dough and bake them when we get there. I’m excited to try these! My daughter’s name is Lexi, so I definitely had to give these a try. Okay, honestly, I made these and they were gone in less than 10 minutes. These taste freaking BETTER THAN THE NORMAL CHOCOLATE CHIP COOKIES. I ended up making 3 batches in less than 24 hours because these were phenomenal. So fluffly, light, and soft. I ended up putting only like 2ish tablespoons of honey, and they were still sweet. But I ended up putting only 2.5 TBS of coconut oil, because I thought 4TBS was too much, and when I made it with that much, it was really oily. Omg so happy I stumbled across this. I rarely comment on recipes but I absolutely had to for this one. These are the best paleo cookies I have made. They are soooo soft and light. I cooked them for 10 minutes and they came out perfect. Next time I’m going to double the recipe. You might want to add. In guide add chocolate as it dint say so had to add them to mixture last which made the texture pretty crap. Shame really! Great recipe – nice texture… dense yet chewy! I additionally covered with wax paper and chilled mixture first in frig for 15 min for dough to firm up, and then using a small cookie scoop, placed on parchment lined sheet and baked 12-15 min for a golden-brown and stable cookie (cooling on flat surface) – perfect for dunking! Coconut flour would not be a 1:1 sub for almond flour. Totally different animal! the flavor is there but mine were really dry and crumbly. I expected them to spread out a little but they just stayed in a little ball. Have you ever encountered this while making them? I definitely want to give this another go. 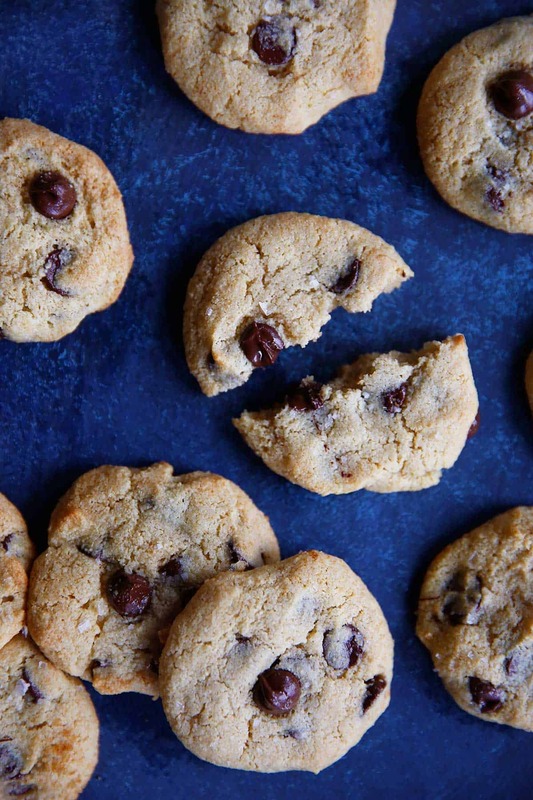 This recipe is so simple it seems like a trick, but the cookies turn out AMAZING. I think the coarseness of the almond flour give it the crumbly/fluffy cookie texture that “real” white flour chocolate chip cookies have. Would I be able to sub all olive oil instead of using coconut flour? I don’t see how that would work! These are the absolute BEST paleo chocolate chip cookies I’ve ever made! And like other have said … I’ve made a bunch of different recipes! These are truly fantastic. 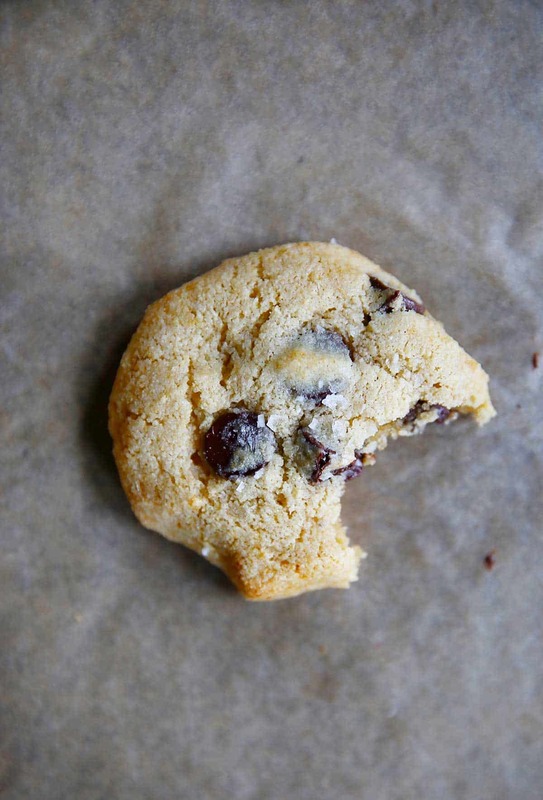 This will absolutely be our go-to cookie from now on. They were devoured within minutes. The only thing I did differently was use maple syrup instead of honey because that’s what I had on hand. Truly fabulous! Thanks for a great recipe!! Delicious cookies! I just started making Paleo desserts for about a month now and this cookie recipe is the best one we have tried so far. They are better than tollhouse! I only used 3 tbl of coconut oil because that is all I had but they came out great. Thanks for this great recipe! If I wanted to sub maple syrup for honey, how much would I use? Likely the same amount Alyse. I just made these & they taste amazing! I used coconut oil & Enjoy Life mini semi-sweet chocolate chips. I also made sure to use my tablespoon cookie scoop after reading that a few reviewers had flat cookies. I’ll be making these again & again. Thanks for the great recipe! How many calories are these each and any protein? You can enter the ingredients into any free online calculator, like myfitnesspal! I- used ghee instead of butter or coconut oil. If you can tolerate dairy, definitely try the butter–I think it would make the cookies better. I’ll try coconut oil next time to see what the difference is. -Because of the liquid state of the ghee, I had to refrigerate the dough for about 10 minutes. If you use coconut oil, you may have to do this as well. -I used a tablespoon to scoop the dough and place it on the sheet pan with silicon liners. -The dough drops fit three across, so 12 per sheet, and spread nicely. I didn’t pat them down before baking, and there was no merging action. -The sheet in the middle of the oven was done right on time (12 minutes), but the sheet towards the top needed 2 more minutes. Thanks for a great CCC recipe! I just made these for the first time and they are the bomb! I followed your recipe, opting for the butter instead of coconut oil. Next time I might try the earth’s balance to keep it dairy free! Absolutely delicious! Thank you! These cookies are amazing!!! So light, fluffy and tastes just like Tollhouse without all the sugar!! Thank you Lexi for this great recipe!! Just made these for the first time. I used butter, but used liquid coconut oil for the extra tsp strictly because I was too lazy to measure a tsp of butter. They are delicious. Thèse were truly amazing! I added some gélatine (a trick I learnt from against all grain) and they were perfect. My husband particularly liked the sea salt sprinkle at the end. Made these with butter and WOW! So yummy! We’ll be making these again for sure!